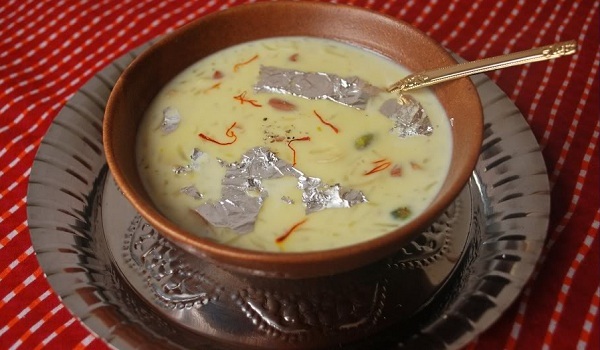 Zafrani Kheer is an Indian dessert made with milk and rice. The rice is allowed to boil with a mixture of milk, cardamom and safrron. Almond slivers and chopped cashew nuts fried in ghee are then used to garnish the kheer thus imparting it a distinct flavor. Mix milk, rice, cardamom, sugar and saffron in microwave proof dish. Cook in microwave at 850W. Heat the ghee for 1 minute in an oven proof bowl. Mix almonds and cashew nuts. Cook it for few minutes. Add almonds and cashew nuts to kheer. Cook the Khee for 10 minutes.